Strange Kids Club is excited to present the first look at the latest installment of Strange Kids Club Magazine. The all-new, nostalgia-filled fifth issue features 60 pages of cosmic misadventure that will take you across time, space and reality-with homages to Masters of the Universe, Critters, Flash Gordon, Star Wars, Krull and plenty more along the way. To kick things off, writer Benito Cereno (Tales From the Bully Pulpit) and illustrator Jonatan Cantero bring to life a new chapter in the saga of Strange Kid, an imaginative boy with the ability to turn his wildest dreams into reality. Together with his best buds-Lando, a smart but relatively normal kid, and Orwell, a Spanish-speaking chupacabra-the boys teams up with their Saturday morning cartoon hero, Bronarr: Space Barbarian, to save the universe from the evil Lord Gammax! Strange Kids Club Magazine #5 can be pre-ordered on Kickstarter through April 26th. This issue will be officially released in late July 2015. Strange Kids Club -an online digest of the strange, geeky and subversive-has been dumpster diving through the underbelly of pop culture nostalgia since 2009. Founded by Rondal Scott, Strange Kids Club began life as an art and culture blog but has since grown into a lifestyle brand focused on comics, toys, film, animation and fashion. While the website delivers a daily dose of satirical and totally biased opinions on entertainment news, the brand is also committed to producing original content which includes a comics magazine, collectible art prints, spoof stickers (Circle Jerks Stickers), digital trading cards (Closet Monsters) and parody apparel. Inspired by comic magazines like MAD, Heavy Metal, Cracked, OINK and Brain Damage-each issue of our magazine focuses a different satirical “theme” that spotlights both creative giants in addition to emerging artists through a combination of interviews, comics and nostalgic retrospectives. Past issues have featured legendary artists like Brent Engstrom (Garbage Pail Kids), David Hartman (Transformers: Prime), Jason Edmiston, and James Groman (Madballs). Based in Austin, TX, Rondal Scott is a designer whose passion for indie comics, absurdist humor and 80s nostalgia serve as the cornerstones of his rebellious-and slightly twisted-way of life. Graduating from Columbus State University in 2001 with a degree in Fine Art, Scott has leveraged his skills as an artist to infiltrate the world of digital journalism. He has contributed to sites including Lost At E Minor, Bloodsprayer, StartFrag and even served as co-editor of Fuel Your Illustration for a time. He is currently the founder, art director and chief creative instigator of Strange Kids Club. This Week’s New Releases: Satan’s Hollow (Final Issue!) and Grimm Tales of Terror! Amigo Comics August 2017 Solicitations: Wolves, Witches and Daemons! 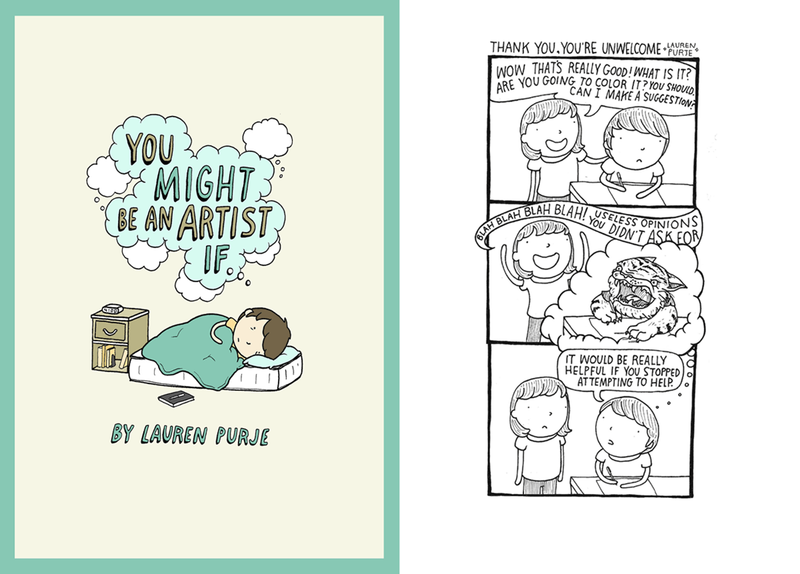 YOU MIGHT BE AN ARTIST IF… you pre-order this book!